The Siang district SP, Pangin police station OC and security personnel sustained injuries from the stone pelting while a lady constable was physically assaulted by the agitators. The bandh supporters also vandalized two police vehicles. 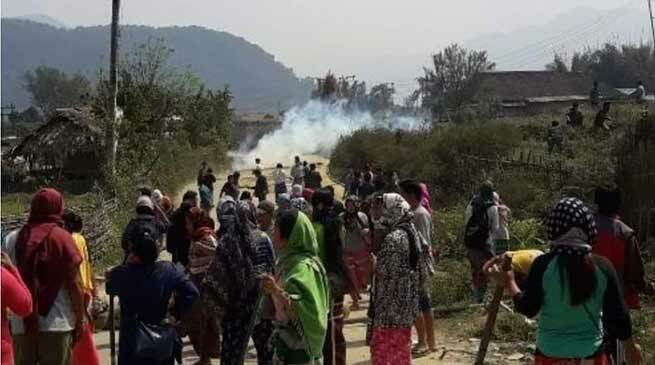 Police on Tursday arrested around 25 agitators for assaulting police personnel, stone pelting, vandalism and using kerosene bomb during the second day of the ongoing 48 hours Pangin bandh. DC Rahul Singh informed that as per the statement of the arrested agitators, mostly women, they have been forced by some local leaders to participate in the bandh call. He informed that the local leaders had threatened to impose fine on those who would not participate and will also cut the panchayat funds to the non participating villages. Also informing that youths from the Adi Students’ Union are involved in the agitation, the DC said that they are now concentrating on identifying the ‘local leaders’ who had forced the villagers to take part in the bandh call. The 48 hours Pangin bandh call began on March 14 and will end today. It is being participated by more than 20 villages in and around Pangin, demanding the state government to refrain from altering the 24 November 2014 notification on Siang district headquarter subject.